One of the best Dutch players in the history of chess, Jan Timman was among the world’s elite throughout his career. 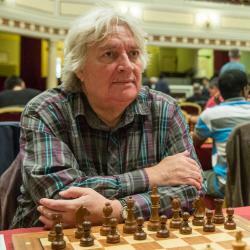 Especially in the 1980s and 1990s when won multiple tournaments and challenged for the World Championship, Timman proved his style of chess-fighting could be a tough nut to crack. One of the first players to employ a wide variety of openings with both white and black, his opening mix-ups became extremely popular with all of the world class players. Jan Timman learned to play chess early in his life and was a strong player at a young age. He became an International Master in 1971 and a Grandmaster in 1974. The same year he became a Grandmaster, he also won the Dutch Championship. He continued to have strong tournament results, especially in the 1980s where he won many high-caliber tournaments. One of his best performances was in a rapid tournament in 1991 where he won four matches in a row against incredibly strong players including Gata Kamsky, Anatoly Karpov, Viswanathan Anand and Garry Kasparov on his way to winning first place. In 1993 he played against Anatoly Karpov for the World Championship but lost the match. Nowadays he continues to be a strong chess player but is no longer considered among the world’s elite.